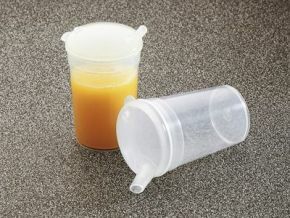 These easy grip plastic feeding cups have been designed to provide the user with a cup that is not too large or heavy, but with enough fluid capacity for a decent drink or meal. The cups have vented lids and drinking spouts that can be used to provide a comfortable feeding position. Makes life so much easier and there is now independence in drinking.